Last week I took a silver clay jewellery course. It was something I've wanted to try and have never done before so it seems the perfect opportunity to link to The Crafters Apprentice's Learn a New Technique (LANT) Challenge. For those of you who don't know Wendy has challenged her fellow crafters to try out new crafts they've never done before and then write about what they have learnt. If you need any ideas for crafts to try then Wendy has compiled a huge list of ideas for you! The course I took was a four day intensive course to teach how to work with metal clay with the aim of coming away having made at least one piece of jewellery each day. There are various different types of precious metal clays but we just used silver. The silver clay is a combination of water, binders and very fine particles of silver. This can be moulded into whatever shape is required and then fired. When it is fired the binders burn away and you are left with a solid piece of metal that is 99.9% pure silver. The first time you see this happen it seems like magic! Or alchemy! I wish I had taken more pictures of the whole process but I was enjoying myself so much I forgot. 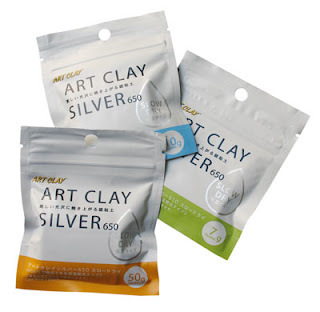 We were given three sorts of silver clay to work with - packets of silver clay (similar to polymer clay or fimo), a little bottle of silver clay paste which could be painted onto things with a brush and a syringe preloaded with silver clay for piping. The first thing we made was a pendant with the metal clay. After playing around with polymer clay to work out a design it was time to use the real thing! We only had 7g packets to work with and the metal clay is quite expensive so it is important not to waste anything. The clay itself is funny stuff - very sticky so you have to constantly put olive oil on your fingers to stop it sticking to you and it dries out very quickly so it is best to work fast. The best thing about the silver clay is that until it has been fired you can keep reworking it - if you make something and you don't like it you can add some water to it, work it for a bit and it becomes clay again. This is excellent for people like me who have a tendency to make lots of mistakes! The texture was added using a rubber stamp with the texture imprinted on it and the circle was cut using a small cookie cutter. It was curved slightly over a domed mould to give it that convex shape and a clay bail was stuck to the back. After the clay was dry we fired it with a small creme brulee torch. It was then polished and stained using liver of sulphur to give the darker look in the crevices. Making a ring is a little tricky because you have to allow for the 10% shrinkage of the metal clay when it is fired. Even though I did this you can see that this ring is a little bit small which is a shame. Although I think it will fit in winter when it is a little colder and my fingers are less swollen! It is difficult to see from the picture but the crystal that I put inside the cork clay is still inside the pendant and gives it a bit of sparkle as it catches the light as well as making a cute little tinkling sound. I really love this piece. Phew! This post it getting a bit long - not long to go now I promise! I really enjoyed this course and would definitely recommend it to anyone who was thinking about having a go at using silver clay. I was amazed by how professional looking the results were after only a few hours of practice. I am also really excited by the idea that I will be able to make things at home now with very few materials. The one downside is that the silver clay itself is quite expensive but I think this is more than offset by the lack of expensive tools needed and the speed with which you can make things. I'm really looking forward to having a go at making more things! I know what everyone in my family is getting for Christmas this year....! PS. Sorry this is such a long post - there was just so much to say. Congratulations if you made it this far!! Wow, the jewellery you made is all beautiful, it looks completely professional! I really do want a go at this. How much does the metal clay cost? Mind you, if you''re giving it as a gift, you can probably explain away the expense. Love this post - all your 'makes' are fab but I especially love the 'caged' design. Well Done. I have never heard of silver clay before and am now going to check out the internet - I particularly love crafts you can do at home and this sounds perfect. Well done you on some fabulous pieces! Thanks everyone - it was really fun. I'd definitely recommend it! These pieces are beautiful! I'd love to take a class in this technique some day -- life is just too short to do it all, isn't it??? Really beautiful! If you found tiny little leaves of different kinds I think they would make lovely charms on a bracelet! Hi! Could you help - I'm thinking of making small pendants for my sisters for Christmas out of silver clay and I can't find anywhere how much clay you'll need for each pendant. If I have a 7g packet, how many small pendants would that make? They would be about the same size as your circle one that you made. Thanks in advance! Thanks for your comment. I can't see how to get in touch with you so will answer your question here - hopefully you'll pop back. I think it took one 7g packet just to make the circle pendant. You have to roll the clay quite thick (three playing cards thick) otherwise it is too soft. Hope that helps. If you leave me your email address I can tell you in more detail.